Tony Edwards scored five goals for Pinchbeck against Riverside. There were only two games in the Peterborough Premier Division on Saturday (August 29), but there was an almighty shock in one of them. Peterborough Sports took their 100 per cent record to unfancied villagers Langtoft United and were beaten 1-0. Paul Kirk scored the only goal of the game in the second half of a match which saw Kane Gilbert of Sports sent off. Sports stay top on goal difference as nearest challengers Moulton Harrox were without a game. Title favourites Whittlesey Athletic made it back-to-back wins in the other fixture as Matt Heron scored both goals in a 2-0 win over Ketton. 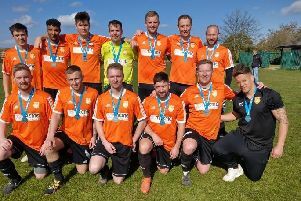 Netehrton United set out on their bid to make it three Chroma Sports & Trophies Shield Final appearances in a row with an 8-3 thumping of Deeping Rangers Reserves at the Grange. Netherton lifted the cup in 2014, but were thumped by Oakham United in the 2015 showpiece. Oakham have since been promoted to the United Counties League so are not defending the trophy. Netherton’s scorers were Lee Clementson (2), Adam Scott (2), Tom Randall, Ben Daly, Ash Jackson and Tom Flatters. Netherton weren’t the competitions most impressive winners though as Pinchbeck United managed an 8-1 win over struggling Riverside. Tony Edwards scored five of the Pinchbeck goals. AFC Stanground sprang the shock of the opening round as a first-half goal from Liam Whaley was enough to sink city rivals ICA Sports. Stanground have lost all four league matches since winning promotion from Division One at the end of last season. Uppingham fought back from a 3-1 half-time deficit to pip Stilton 4-3 after extra time, while Holbeach United Reserves won 3-2 at Crowland. Thorney are unbeaten in all competitions this season, a record they maintained with a 5-1 cup win at home to Leverington. Centre-back George Edwards scored twice with Eric Kwakye, Dean Merryweather and Connor Pridmore also on target. Holbeach United Reserves (Chappell, Grimwood, Smith) 3.